Our most unique and perhaps most beautiful of all blue diamond rings. 14K White Gold Art Deco Ring set with a 1/2 Carat Blue Diamond. Also available in 1/4 Carat and 1 Carat as well as in 14k two-tone gold, shown below. Also available as a black diamond ring or a white diamond ring. All of our blue diamonds are authentic, natural diamonds that have been treated. 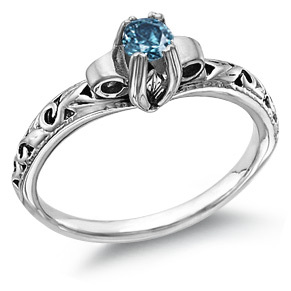 We guarantee our Blue Diamond 1/2 Carat Art Deco Ring to be high quality, authentic jewelry, as described above.